As the holidays approach and the year draws to a close, many taxpayers make charitable gifts — both in the spirit of the season and as a year-end tax planning strategy. But with the tax law changes that go into effect in 2018 and the many rules that apply to the charitable deduction, it’s a good idea to check deductibility before making any year-end donations. Last year’s Tax Cuts and Jobs Act (TCJA) didn’t put new limits on or suspend the charitable deduction, like it did to many other itemized deductions. Nevertheless, it will reduce or eliminate the tax benefits of charitable giving for many taxpayers this year. Itemizing saves tax only if itemized deductions exceed the standard deduction. For 2018 through 2025, the TCJA significantly increases the standard deduction, to $24,000 for married couples filing jointly, $18,000 for heads of households, and $12,000 for singles and married couples filing separately. The nearly doubled standard deduction combined with the new limits or suspensions of some common itemized deductions means you may no longer have enough itemized deductions to exceed the standard deduction. And if that’s the case, your donations won’t save you tax. So before you make any year-end charitable gifts, total up your potential itemized deductions for the year, including the donations you’re considering. 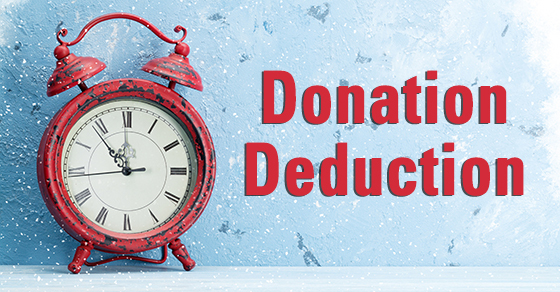 If the total is less than your standard deduction, your year-end donations won’t provide a tax benefit. You might, however, be able to preserve your charitable deduction by “bunching” donations into alternating years. This can allow you to exceed the standard deduction and claim a charitable deduction (and other itemized deductions) every other year. The IRS’s online search tool, Tax Exempt Organization Search, can help you easily find out whether an organization is eligible to receive tax-deductible charitable contributions. You can access this tool at http://apps.irs.gov/app/eos. Information about organizations eligible to receive deductible contributions is updated monthly. Remember that political donations aren’t deductible. We’ve discussed only some of the rules for the charitable deduction; many others apply. We can answer any questions you have about the deductibility of donations or changes to the standard deduction and itemized deductions.